Bloody drag markes created by dragging the dog. 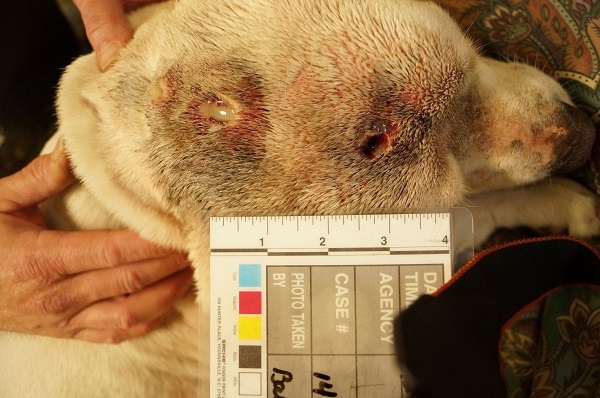 Ocala, Florida — On April 27, 2014, Ocala Police Officers Wabbersen and Drawdy responded to the 1100 block of NE 13th Street in reference to a domestic dispute and beating of a dog. Callers reported hearing lots of screaming and a dog yelping coming from inside a residence. Upon arrival, a group of neighbors were standing in the street and were more than happy to point out the house in question to the officers. A man, later identified as Steven Fleming, 49, was seen walking west from the residence. According to reports, Officer Drawdy exited his patrol car and instructed Fleming to stop. Fleming looked directly at Officer Drawdy, then fled on foot and jumped a fence. Officer Drawdy jumped the fence and gave chase, followed by Officer Wabbersen. Officers were able to catch up to Fleming and place him under arrest after a little resistance from him. Fleming also had two knives in his pocket at the time of his arrest, and his jeans were saturated in blood. 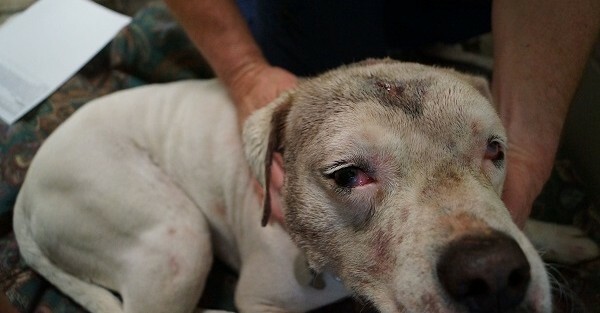 Witnesses stated that they yelled to Fleming to stop beating the dog. They said just prior to police arriving, the dog ran out of the house. Witnesses stated that Fleming then charged them, yelling, “you coming at me…you challenging me?” That is when the police arrived and he fled. The investigation revealed that neighbors had taken the dog to safety. 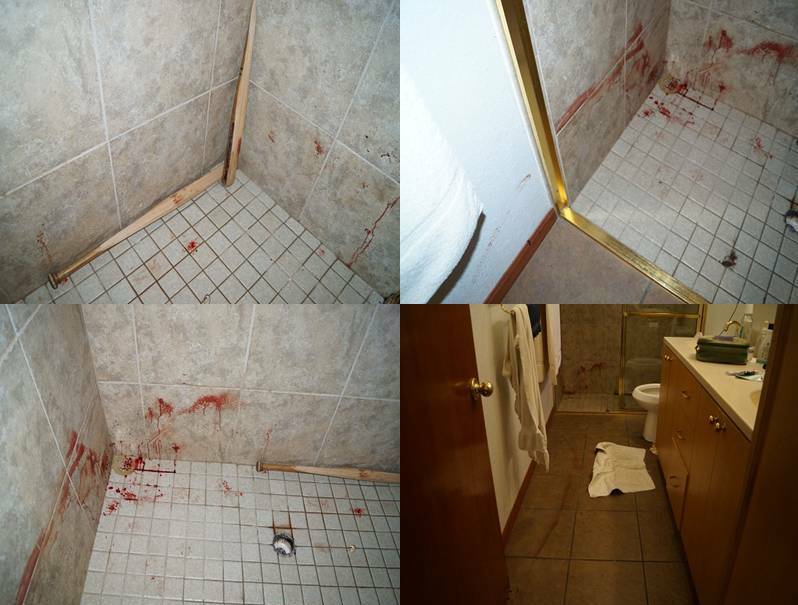 The dog, a female American Boxer Lab mix named “Molly,” was completely soaked in blood. She had three visible deep lacerations on top of her head, blood in her nasal cavity and blood coming from her ears. Her third eyelids were visible and her face was swelling. 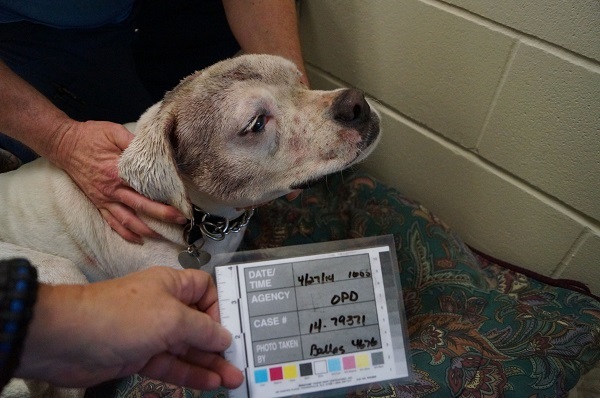 Animal Services Veterinarian David Jebens examined Molly after being transported by Animal Services. 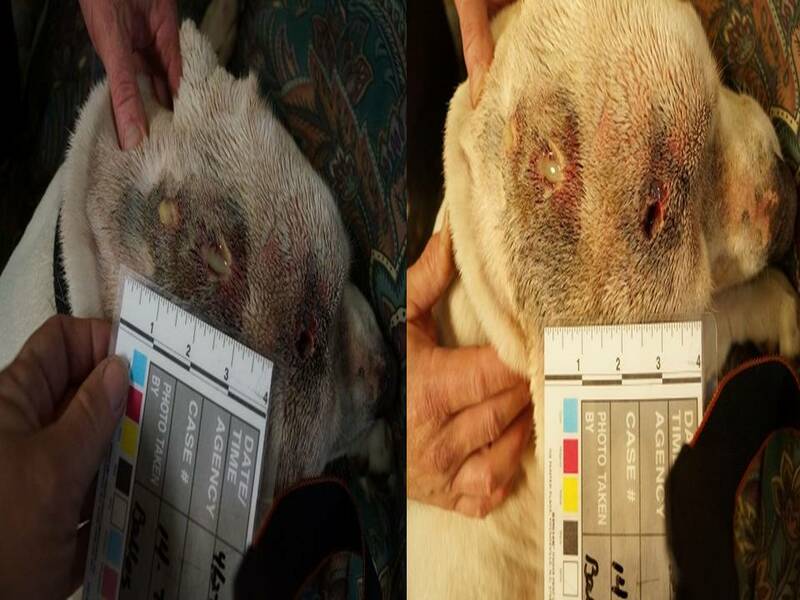 The examination revealed that Molly [the dog] had a fractured skull and had been stabbed through the top of her head three times. One of the stab wounds penetrated the bone into the left sinus cavity. She had swelling around her left eye, and bleeding from the nostril as a result of the damaged sinus cavity. 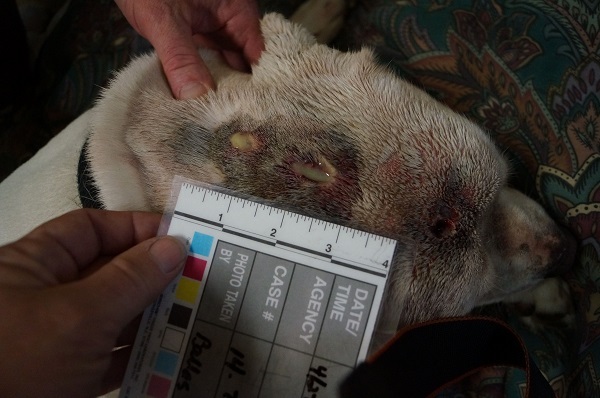 The blood coming from the dog’s ears was due to a mixture of the stab wound piercing the sinus cavity and sustaining a fractured skull from being bashed in the head with a baseball bat. According to reports, the pattern of the wounds on Molly’s head indicated that she was looking up at Fleming when he stabbed her in the head. 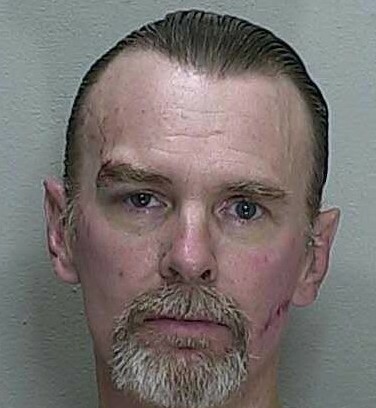 Neighbors stated that they felt that Fleming’s girlfriend, Judy Rangle, was inside the home and may have been injured. 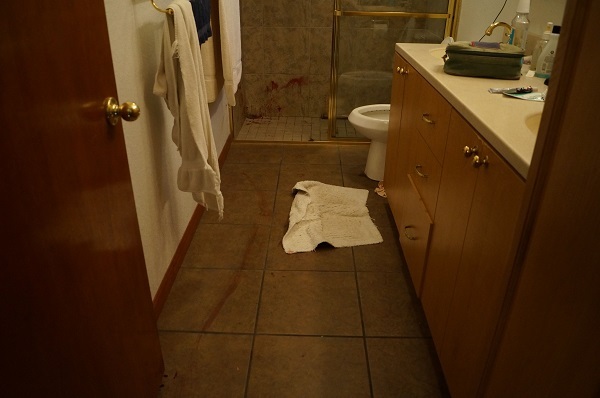 When officers entered the house, they found overturned furniture, blood on the floor in the hallway, blood on the back of the back door, blood on the floor in the master bedroom as well as bloody drag marks from the adjacent bathroom. 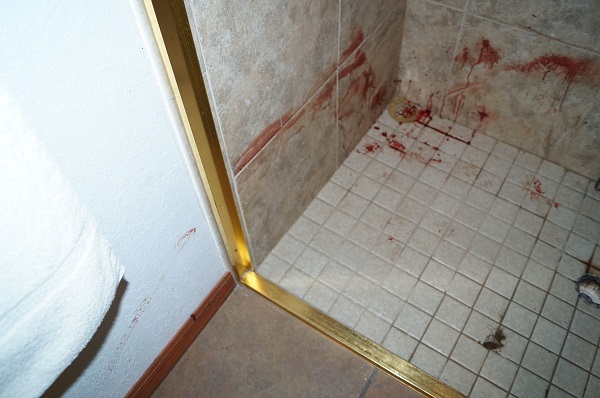 Inside the bathroom, officers found blood on the walls and floors, as well as a broken bloody baseball bat that was most likely used to fracture the dog’s skull. 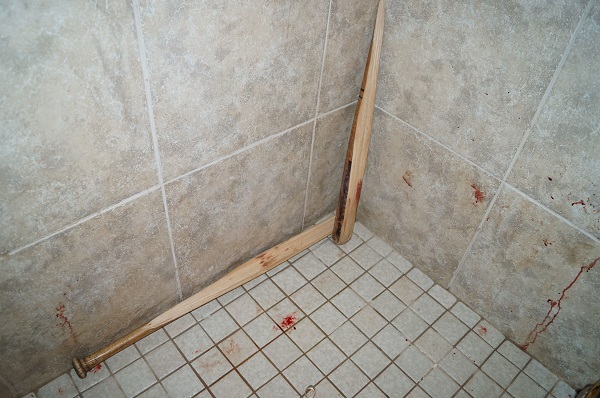 Shows broken bat and blood in the shower. Also, drag marks from where the dog had been dragged. Officers later determined that Rangle was not home during the incident. She and Fleming had been drinking at a local lounge and he had returned home after arguing with her. Officers responded to the lounge, but Rangle was extremely intoxicated and could not stand on her own nor hold a conversation. Officers actually found her passed out next to a tree. During the investigation, officers learned that Rangle is a veteran suffering from PTSD. The Veterans Affair Administration advised that Rangle has a history of self-medicating with alcohol in an attempt to treat her PTSD. EMS had to be called due to Rangle’s high level of intoxication. Fleming was charged with Aggravated Animal Cruelty-Attempt to Mutilate or Kill, Resisting Arrest, and Violation of Probation for Possession of Cocaine charges stemming from a previous arrest. Fleming refused to cooperate with police. He is being held on a $5,500 bond. Molly is being treated for her injuries, her prognosis is unknown at this time. Ocala Post was able to make contact with Animal Services today. They were more than cooperative and extremely compassionate toward the situation.